As for tracking, the alignment was considered "correct" if they did track just a little to the right (outward). When I was 18 (long long long time ago and pre radial tires) my dad told me the same thing when I told him the car seemed to go right if you let go of the wheel. He said that it was a done so if people went to sleep it would help avoid a head on collision. I have had radial and bias ply tires on my Camaros, Mustangs and Impala, the radials are nice and have less friction going down the road. The bias ply IMO look period correct,( which I really like the squared off tire look), but tend to track a differently than the radials. I don't drive my vehicles often enough for it to bug me, if I drove them more often and on roads that had many cracks it may influence my decision making for what tires I would run. Also at this point with how expensive tires have gotten they would also factor in now a days. I think the "drifting to the right" is from back in the day when most roads were two lane with a crown in the center to drain off water. Four and more lanes today don't have a crown, think a banked NASCAR track. The book settings are from 1969, a good alignment guy should be able to recommend settings that will work with your car on todays roads. Bias-Ply tires need the toe-in settings shown in the Assembly Manual and the Chassis Service Manual; radials want zero-to-1/16" TOTAL toe-in. If you run the radial settings with bias-ply tires, you'll need constant steering corrections (even more than you require with bias-ply settings). Bias ply tires generally follow the ruts that are really on any road, interstates included. Ever notice how you can hydroplane easier in the right lane at speed on an interstate ? It's because of the slight depressions from trucks and heavy traffic in that lane, constantly, that funnel water in the lane, causing it to puddle and wedge under the tires. Radials resist it better, but bias ply builds are more sensitive to changes in the road surface. Couple that with manual steering, quick ratio, and these things were a challenge to drive - but I still love them (for the look !). Driving my Pace Car home after purchase, some 125 miles in several July thunderstorms, was downright horrendous after so many years of radial tire equipped company vehicles (at high speeds). Car was all over the road, darting everywhere, hydroplaning, and drifting from side to side. First purchase after I got it home was a set of B.F. Goodrich Radial T/A's, which dramatically cured the ills noted on the ride home. I resolved never to run bias plies on the street, but as a show tire Goodyears still have the charisma. 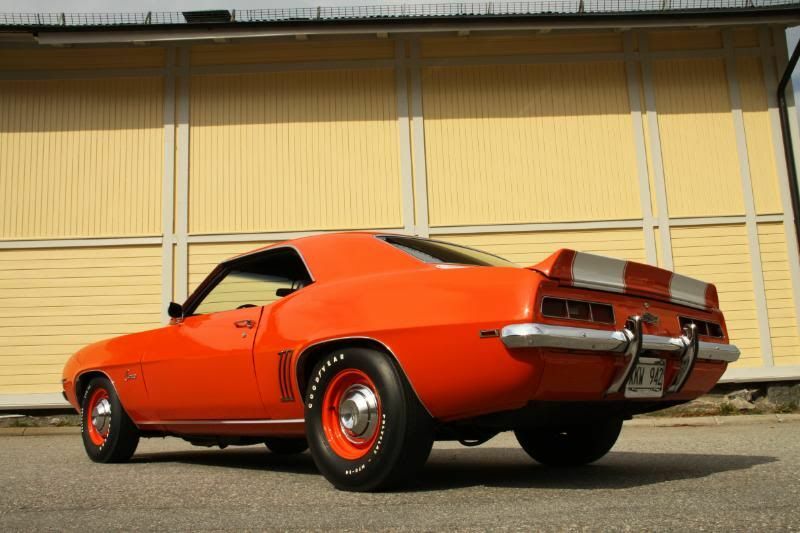 No - this is not a right hand drive export Z28. The local photo shop was kind enough to reverse the field when they copied the slide - it's backwards. If those tires were on your car since 76 and then you went and sold them at the flea market, it is safe to say you got your money out of those tires! The car looks great in that photo. Since a couple of years I drive my 69 with Good Year Polyglas without any problems at all! It's H70-14 in the rear and F70-14 in the front! Could it be that I lowered the car app. 2" with Hotchkis sport leaf in the rear and front that makes it works so fine?? Although I was asking about info for my 68, your 69 should be similar. I followed David Pozzi's alignment recommendations and my car drives very nicely with Polyglas F70-14s all the way around. No 'wander' or 'pull' at all. My car has all new suspension bushings, and the suspension bolts were all tightened to factory specs after the suspension settled.